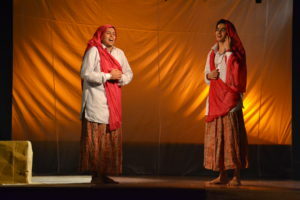 The man, the woman, and the transgender: all portrayals of Maati, the titular character that takes center-stage in Drama School Mumbai’s Hindi adaptation of Federico Garcia Lorca’s Yerma. Director Mahesh Dattani’s reinterpretation, however, is about more than just a woman looking for fulfilment through motherhood. 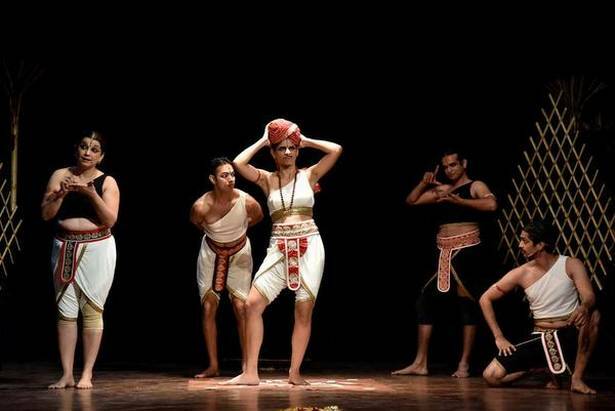 Instead, Maati becomes a vehicle for exploring gender roles and bending them on stage. 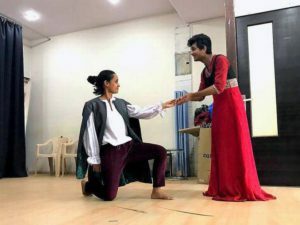 So we decided to take a look at various other productions that use gender-bending and cross-dressing to challenge the roots of a fiercely conservative Indian theatre. The power in the portrayal of a transgender dates back to mythological times. Shikhandi is a play that draws on the epic Mahabharata, telling the tale of Amba, reborn as Shikandi to take her revenge on Bhishma. 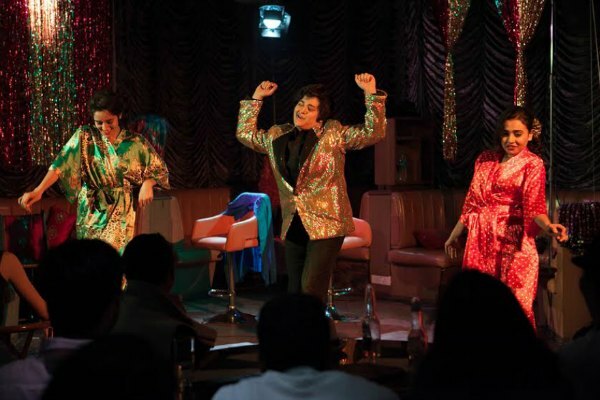 Director Faezeh Jalali’s work draws attention to the taboos associated with LGBT individuals, exposing gender stereotypes to battle through and hopefully overcome gender cliches that have emerged from social constructs. 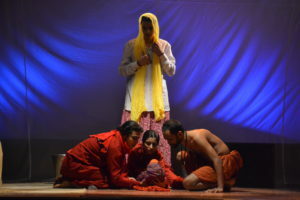 By highlighting Shikhandi’s gender transformation as a consequence of social norms rather than chalking it down to destiny as it most often is when the story is told, Jalali brings in an angle that speaks out about the character’s sexuality and identity. The challenge, though, does not restrict itself to the audience, challenging even the artists who are involved in the portrayal of this excitingly tenuous world. For actor and director Neha Singh, this whole space is novel in and of itself. Dohri Zindagi tells the tale of a girl raised as a boy in patriarchal Rajasthan, who is then, as custom dictates, married to another woman. “While researching, we realized that male and female are just two extremes of the gender continuum. 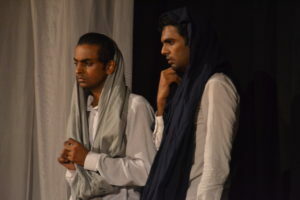 Our behaviour, experiences, relationships and desires oscillate between these two extremes on the gender spectrum,” says Singh who acted in and produced the play. The revelation brought clarity, allowing her and her fellow artists to focus on delivering the story as “authentically” as they possibly could. “Honesty and vulnerability are the best approaches while being true to the story one is trying to portray,” she adds. The sentiment is echoed by Vikram Phukan, director of Tape, a new stage production by the Gaysi Family that brings together improvisational performances by actors Puja Swarup, Sheena Khalid and Rachel D’Souza to showcase the colorful world of drag that most people picture when they hear the term ‘cross-dressing’ today. Earlier in April, theatre-maker, educator and Shakespeare aficionado Deshik Vansadia’s adaptation of The Taming of the Shrew opened to full houses. It’s a cross-dressed version, with men playing female characters and vice-versa. 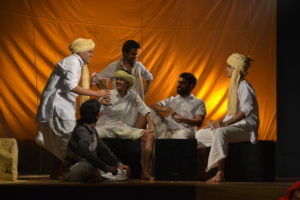 While the play itself has often been called out for being regressive and highly misogynistic, Vansadia’s view of the play as satire is what he hopes will make a change. “We are all being tamed, men or women,” he said in a recent interview with The Hindu. That explains how his version, which plays with and combats gender stereotypes by alternative casting while still retaining the material, could very well be the head-on combat against societal misogyny. It’s a step in the right direction, no doubt, integrating characters in drag onto the main stage in a way that inspires the audience to laugh, then introspect. And yet, it only makes a dent in offering respect for the personalities, from the transgenders and hijras to the iconic drag queens, who have been marginalized for so long, ostracized for their craft, rather than celebrated. A large part of that dent can be attributed to Saggherr Loadhii and his production of Hijda, a Marathi play that centres around two characters, one of whom wants to be a hijra. The other, a transgender that reflects its tradition. Opening to full houses back in 2014, the play marked a turning point in Indian theatre but also showed how far we still have to travel. Society is undergoing a metamorphosis. Mapped by spotlights shining on the faces of earnest artists, the understanding of gender as we know it is shifting. The future, then, will see artists pushing the ‘gender envelope,’ toying with personalities and personas until they represent characters from all walks of life. Till then, the stage is but a medium to explore and discover what lies ahead. 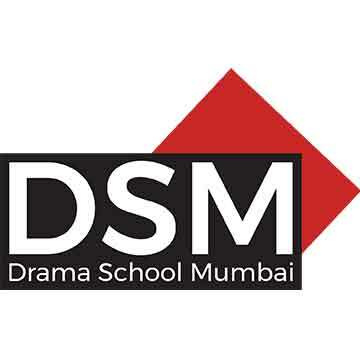 For those interested in discussing gender identities in theatre, contact Drama School Mumbai.